This hearty soup is filling and satisfying without being heavy in the least: hearty from the turnips and lentils and light because it’s made with water—and it’s vegan as well. Most of the work comes from dicing the vegetables; the actual cooking time is no more than 30–45 minutes. In a large soup pot over medium heat add the oil and sweat the onions until softened, 3–4 minutes. Add ginger, garlic, tomato paste, and curry powder and simmer another 3–4 minutes, stirring well. Add carrots, celery, and turnips and cover with 8 cups water. Bring to a boil, then add lentils. Reduce heat, cover, and simmer for about 30 minutes, or until vegetables and lentils are tender. Add zucchini during the final 5–10 minutes of cooking. Season to taste and serve with garnishes, if desired. 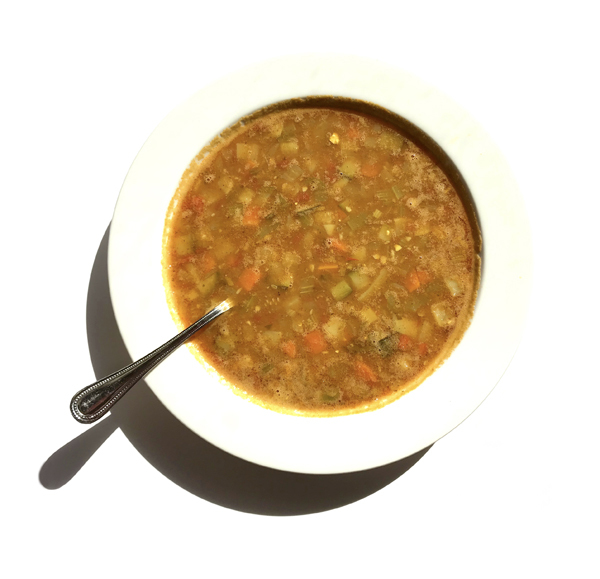 Want more delicious soup recipes? We've got lots of them in our Feel Good Food Cookbook. Get a copy here.